The cornerstone of the church building at Gloria Dei (Old Swedes’) was laid in 1698 and was dedicated on July 2, 1700. Old Swedes’ is the oldest surviving brick building in Philadelphia, the oldest church building in Pennsylvania and the second oldest in the United States. Although those directing the building of the church had emigrated from Sweden, they chose to use local builders trained in the English craft guild tradition. Hints of the Georgian style, which was common to Philadelphia building for most of the 18th century, can be seen in the building’s symmetrical composition and in the Flemish bond brick pattern. The steeply sloping roof is reminiscent of Swedish churches as is the semicircular wall at the east end of the building. As originally built, the church was a simple rectangle, 30 feet by 60 feet. Although the walls were quite thick, they began to bow in 1704 under the weight of the steep sloping roof. To arrest this process and preserve the building, a sacristy was built onto the north side of the church and a vestibule onto the south side. These acted as buttresses and also gave the building a cruciform footprint. By the 1840’s the congregation had grown so large that the church was in danger of demolition. The decision was made to renovate the building by raising the floor and adding balconies, a center pulpit, and the stained glass window. The building remains essentially unchanged since that time. The rectory and the sexton’s house were built in the 1830’s, Riverside Hall in 1863, and the Roak House in 1969. All the buildings are of brick construction with entrances facing the cemetery. The Church contains many elements with historical significance. The Swedish style baptismal font was crafted in 1731 and is one of the oldest fonts still in use in the country. Hanging from the ceiling are models of the two ships that brought the Swedish colonists to these shores, the Kalmar Nyckel and the Fogel Gryp, and a chandelier, all designed and given to the church by Carl Miles, a noted Swedish sculptor. The church building houses one of the earliest pipe organs in America, a 1903 Hook and Hastings tracker organ. The organ was removed and completely restored in 1994. Gloria Dei was designated a national historic site in 1942. The legislation called for the federal government to give us “an appropriate setting” which eventually resulted in the removal of all non- church structures on the block. The original 2 acres of open space was enlarged to five acres, landscaped and surrounded by a perimeter wall. 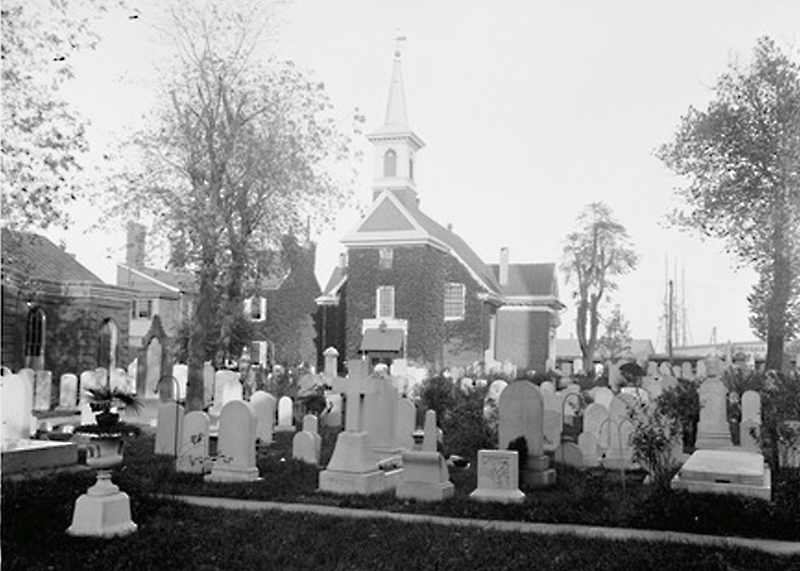 The buildings of Gloria Dei border the cemetery on three sides, with the church to the east, closest to the Delaware River, the rectory, Riverside Hall and sexton’s house to the north, and the Roak House, containing church offices, meeting rooms and a secular nursery school, to the west. Photo courtesy of Tom Crane, ©2000 Tom Crane Photography Inc., as seen in Historic Sacred Places of Philadelphia ©2005 The Barra Foundation, Inc.